A security gate is an important piece of the perimeter security and access control for a commercial or industrial facility’s security system. The purpose of these devices is to control access to specific areas of the complex to authorized staff members and/or visitors. Depending on the size of the area, facilities can utilize a combination of both exterior and interior security gates. For example, it is common for a large parking garage to have a main entry point for all cars, but also a secondary access point for reserved parking spots intended for staff or VIPs. Security gates are not only applicable to commercial and Industrial scenarios, they are also often seen in residential settings, including entrances to condominium complexes and private communities. For today’s modern security gate usage, there are five gate designs that are commonly used: Slide Gates, Swing Gates, Vertical Lift Gates, Vertical Pivot Gates, and Bi-Folding Gates. The Slide Gate or Rolling Gate is one of the most common gates used for security applications. When it opens, the gate moves sideways to the left or right and aligns parallel to the fence to allow the vehicle to enter. 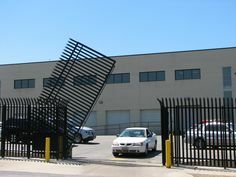 These types of gates are commonly found at storage facilities, and easily align with the facility’s perimeter fence. A Swing Gate moves like a traditional door would by opening at one end and swinging one way or the other to allow access. Another option for this type of gate is the use of a double door style. To open a Vertical Lift Gate, the gate moves upward rather than to the side like the gates described above. 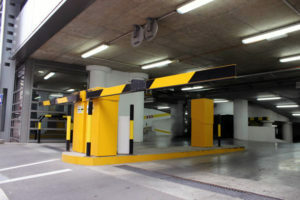 Using height sensors, the gate will be raised above the height of the authorized vehicle, allowing them to pass through. This gate is ideal in areas where side spacing is more compact. This traditional style is one of the most commonly installed gates by Bulldog Fire and Security. This gate opens by rotating up at one lower corner, hence pivoting 90 degrees to allow access. This design is most suitable in industrial settings. With the Bi-Folding gate model, two gates connect in the middle when in a closed position. Each of the gates are divided into two sections on hinges, which allow the gate to fold when they open. These gates traditionally open quickly, and are ideal for usage that requires fast entry or exit. For 18 years, Bulldog Fire and Security has been an expert in security gate installation, having installed a variety of Security Gate Systems in numerous applications across Southwestern Ontario. To learn more about Security Gate Systems and the role they can play in your building’s access control and security system, call us at 1 866 670 1590, email info@bulldogsecurity.ca or fill out the contact form below.